Treacle tart is something of a British classic. Frugal and filling, it also has a delicious decadence, its humble ingredients coming together in a dessert with much greater elegance than the sum of its parts. Loved by generations of Brits, this syrupy tart achieved global recognition a few years back when chosen as the favourite pudding of a certain bespectacled wizard – for Harry Potter to choose treacle tart over Fizzing Whizzbees, Cauldron Cakes and Bertie Bott’s Every Flavour Beans, it must be something pretty special. This classic pudding consisting of pastry, golden syrup and breadcrumbs is also a firm favourite of mine (you might have guessed that any dessert involving bread gets my seal of approval). Served warm with a big dollop of clotted cream or ice cream, it’s the ultimate comfort food, dishing out heaps of nostalgia in a single syrupy slice. Some people find it a little dense and rich, but in the recipe below the filling is softened with a little cream and eggs, and cut through with the zest and juice of a lemon to balance out the sweetness, a tip gleaned from Josecline Dimbleby in my Mum’s ancient edition of The Cook’s Companion. This recipe also includes a sprinkle of rosemary salt. It might sound slightly bizarre, but the rosemary infused salt helps to develop a certain depth of flavour in an otherwise itchingly sweet filling. I got the idea from a Gizzi Erskine recipe for Millionaire’s Shortbread and it really works. Look around town and there’s hardly a trendy restaurant that hasn’t jumped on board the salty-sweet wagon with their variation on a salted caramel or chocolate dessert. And with the rise of balsamic strawberries, chocolate with olive oil and other seemingly strange combinations, our palates are becoming more receptive to the challenge of unusual salty, sweet and savoury combinations. Of course you could leave the rosemary salt out altogether, but if you like experimenting with food, I urge you to give it a go. The pastry here is a simple sweet shortcrust taken from Dan Lepard’s brilliant new baking book, Short & Sweet. My first attempt at a Heston recipe involving equal quantities of butter and flour (am I making a tart or a croissant?!) ended in a big buttery mess on the kitchen worksurface, so my recommendation if you’re fairly new to pastry is to stick with Dan – follow the instructions below and you can’t really go wrong. I used brown breadcrumbs for their lovely nutty flavour and texture, but you can sling in pretty much any old bread odds and ends you might have to hand. The lemon and double cream really lift the filling, making a softer, more pleasing pudding all round and finally, I’d suggest making up more rosemary salt than you need for this dessert – it keeps for ages and is just as good on savoury food as when used to add that element of salty-sweet to a pud. What’s your favourite British dessert? And what do you think to the rise of salty-sweet flavours in mainstream baking? Just one bite is never enough . . . Strip the leaves from the rosemary and mix in a small bowl with the sea salt, rubbing together to ensure the rosemary aroma is released. Cover until ready to use, leaving for a minimum of 24 hours to infuse. Put the clotted cream and milk in a non-stick pan. Scrape the vanilla seeds from the pod, then add pod and seeds to the pan and bring almost to the boil. Remove from the heat and leave to infuse for 20 mins. Cream together the eggs and sugar. Bring the milk and cream mixture back to the boil, then strain over the egg yolks, whisking all the time. Return the whole mixture to the heat and cook over a gentle heat until it coats the back of your spoon and a creamy custard is formed. Leave to cool completely, then churn in your ice cream maker. Brush a 20cm round tart tin with a little melted butter. Take the pastry out the fridge and let it soften ever so slightly. Divide in half and freeze for use at a later date or bake as biscuits (you could also double the filling quantities below and make two tarts if you’ve got a crowd to feed). Flour the work surface and your rolling pin, then press the dough out slightly with the rolling pin, flipping it a few times and smoothing flour on each side. Then roll the dough out quickly, turning regularly and checking that it hasn’t stuck to the work surface. If it does dust with a little more flour. Aim to roll the pastry around 1/2 cm thick. Roll the pastry round your rolling pin then ease it over the prepared tin. If it starts to tear, you can always patch it up so don’t panic too much – it may look slightly less beautiful but will taste just as delicious! Prick the pastry base all over with a fork and pop in the freezer for around an hour. Preheat the oven to 180 degrees C. Line the pastry with non-stick baking paper and baking beans, rice or coins. Bake for 20-25 minutes then remove the baking paper and weight, lower the oven to 170 degrees C and cook for another 5-10 minutes until lightly golden but barely cooked on the base. Heat the golden syrup over a gentle heat until slightly more liquid and easy to work with. Mix in the breadcrumbs, lemon zest and juice, eggs and cream until fully incorporated. Remove the pastry case from the freezer. Place on a tray in the middle of the oven (just in case any filling spills over – it will save you from cleaning up a big sticky mess! ), then pour in the filling until level with the edge of the pastry crust. Bake for 45 – 50 minutes until golden brown and fairly well set. Remove from the oven, allow to cool fully on a wire rack then remove from the tin. Sprinkle carefully with rosemary salt – not too much, you want that slightly salty-sweet taste without overpowering the pudding. Cut into thick wedges and serve with a velvety scoop of clotted cream ice cream. I have a hangover. And yet this looks bloody delectable. I love treacle tart — as an Amurrican I only had it for the first time a couple of years ago — and I’m excited to try this, as soon as I am no longer hungover. This is right up my street, and looks completely gooey and gorgeous. Harry Patter was a very wise wizard indeed. About the salt, I always use salted butter in place of unsalted in dessert recipes – it adds a little something to the party I always think. Rosemary salt! Now I have to try and bake with that. Thanks for sharing. Your tart looks gorgeous! What a fantastic flavour combination. This is making my mouth water! Love your photos. Anne Marie – I often use salted butter in my baking too – I think it brings out the flavour. Baker Street – thank you 🙂 definitely recommend giving the rosemary salt a go. Not Quite Nigella – haha yep, a fair bit of eating did go on while I was taking these pics! The Littlest Anchovy – aw thank you. It’s quite hard to make a big brown tart look appetising but I’m really pleased with how the pictures came out. I’ve never had clotted cream though. I don’t know if it’s the name, but it makes me feel a bit queasy thinking about it. I imagine it to be unpleasantly sour. 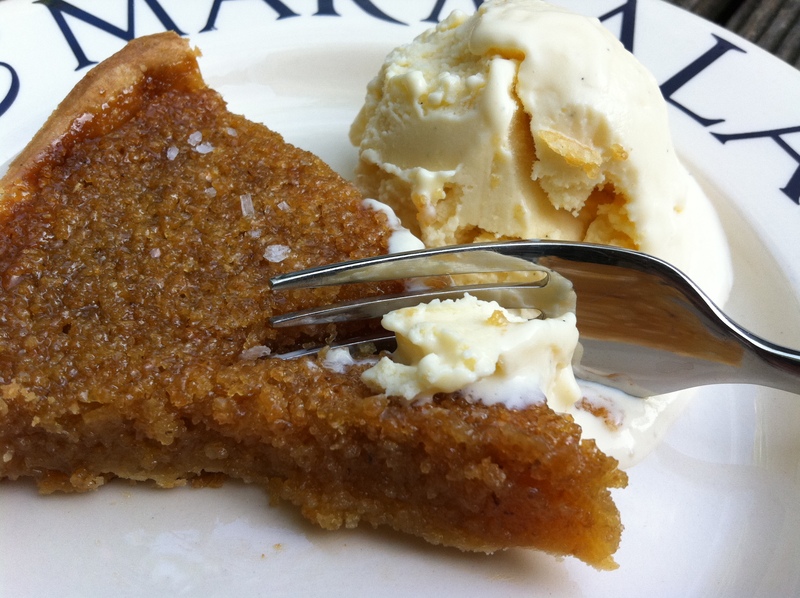 I can’t believe you didn’t have treacle tart as a child….you definitely have some making up to do! And am amazed you’ve never had clotted cream! I promise it’s delicious – think of super thick creamy cream, no sourness or bitterness just smooth rich unctuous goodness. Yum. I am positively swooning at the thought of this. I love the salt/sweet combinations. The first time I tried salted caramel ice cream at Bi Rite in San Francisco, I nearly cried (it really is that good). My favourite British dessert I think is still bread and butter pudding. Comfort food, defined. 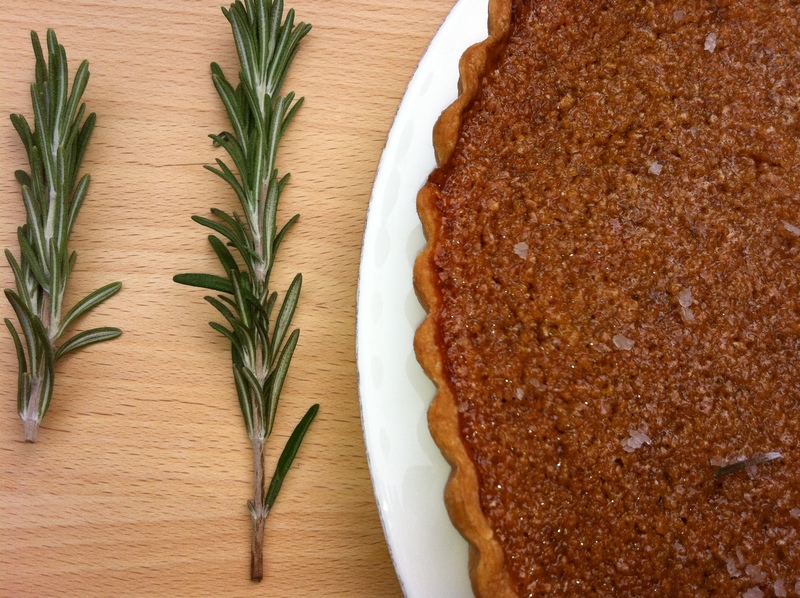 I love treacle tart, I’ve been trying to think about how I can update it for ages and I love the addition of rosemary salt, just perfect! Yum, that tart looks lovely! Love salty and sweet together, so this sounds perfect. Salty and sweet is such a nice combination, I love the idea of making rosemary salt to accompany this tart. I love a syrup sponge if I’m honest with lashing of custard! There is a huge trend for salty sweet stuff at the minute. I’ve been a bit of a fan of salty sweet things for a while – after having visited Thailand where salt & sugar are completely necessary for cooking! I also love salted butter caramels which my mum buys me ever year for Christmas from Bruges too! London Bakes – it definitely lifts the tart. I’ve heard ginger is also a lovely addition, although I’ve never tried it. Gourmande in the Kitchen – seems like pretty much everyone is in favour of the salty-sweet combo, it’s just so delicious. Lay the Table – I love Thai food and you’re absolutely right, it’s all about the balance of salty, sweet and sour. I love salted butter caramels too, yum. Im from scotland so treacle tarts dont pull on any nostalgic heart strings for me im afraid but i do love herbs in puddings, think this could be the new salty sweet trend… you knows, who cares, ill eat whatever is tasty. The rosemary is an interesting twist on the old treacle tart which incidentally is one of my favourite british puddings. I also really love Manchester tart which is abit harder to find. I like the sweet and salty thing that seems to be popular at the moment, particularly salted caramel cakes and macarons. This looks sooo yummy, Im british and Ive never tried treacle tart, it has somehow escaped me which is bizarre! The salty combination in your recipe sounds delish. Thanks so much for this post! As a huge fan of Harry Potter (but sadly not a brit), I’ve always wanted to know what Treacle Tart was! I thought it was made up, haha. British desserts always intrigue me… I really want to try some out. Ths has to be one of my all time favourite desserts from childhood! So rich and sugary but so good! It looks lovely and I am really excited to try the clotted cream ice cream! Yep…as you mentioned..I can’t help thinking ‘Harr Potter’ upon seeing ‘Treacle Tart’ lol I’ve never tried one, but the ingredients are reminiscent (to me) of a Chess Pie, minus the breadcrumbs …or a yummy pecan pie goo. Love the clotted cream ice cream and the rosemary salt! As always – another beautiful, mouth-watering dessert! The Twice Bitten – definitely going to try more herbs in puddings soon…apparently chocolate and rosemary is delicious, and tempted to try something with thyme. With Milk & Flour – I’ve never had Manchester tart – one for the list to try I think! Ruth – definitely a nostalgic childhood dessert. The rosemary salt brings it up to date a bit but you could easily make without. Cafe Lula – clotted cream ice cream is lovely, really thick and delicious, although if pressed I’d find it quite hard to distinguish from a really rich normal vanilla ice cream. Lisa – I’ve never heard of Chess Pie…am off to google now! Also, I LOVE that you added rosemary salt. I think herbs in desserts adds a new level of experience (chocolate and rosemary together is such an interesting and unusual combination). You had me at rosemary salt. I love combining savoury flavours with desserts. There’s something so unexpected about it and it always seems to work. Thanks for sharing this amazing looking recipe! Kristin – I don’t think I’ve ever tried chocolate and rosemary but it sounds really interesting, will have to give it a go! Kristen – thank you 🙂 It really is surprising how well the rosemary salt works. 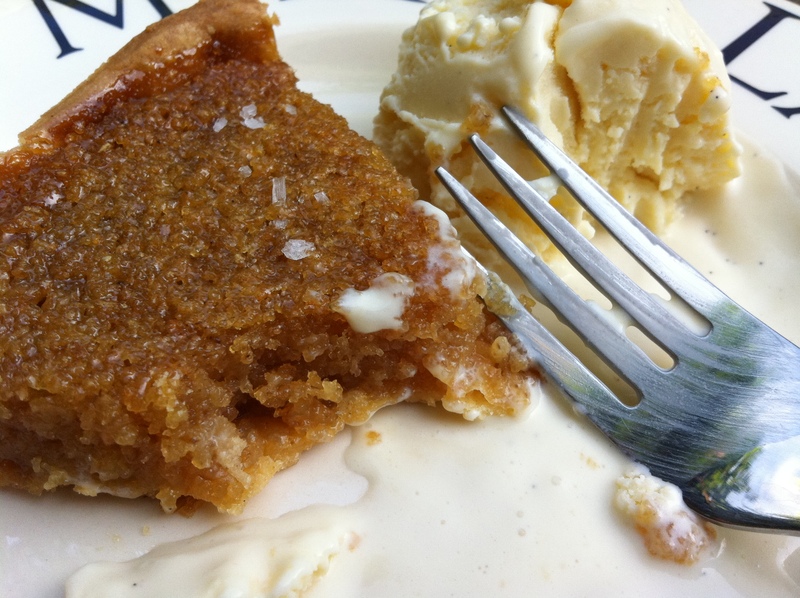 Ah treacle tart – that was my grandmother’s mainstay and immediately makes me think of her. I haven’t had it for years but immediately start wincing at the prospect of that syrupy sweetness. Your version sounds infinitely preferable and now I’m quite keen to try it with my rye sourdough breadcrumbs maybe. Quite excited by your rosemary salt tip – must get my act together on that one. i see you have been using Short&Sweet. Looks Awesome- that looks like it melts in your mouth! Love the rosemary! This is fantastic. What an amazing ice cream flavor! 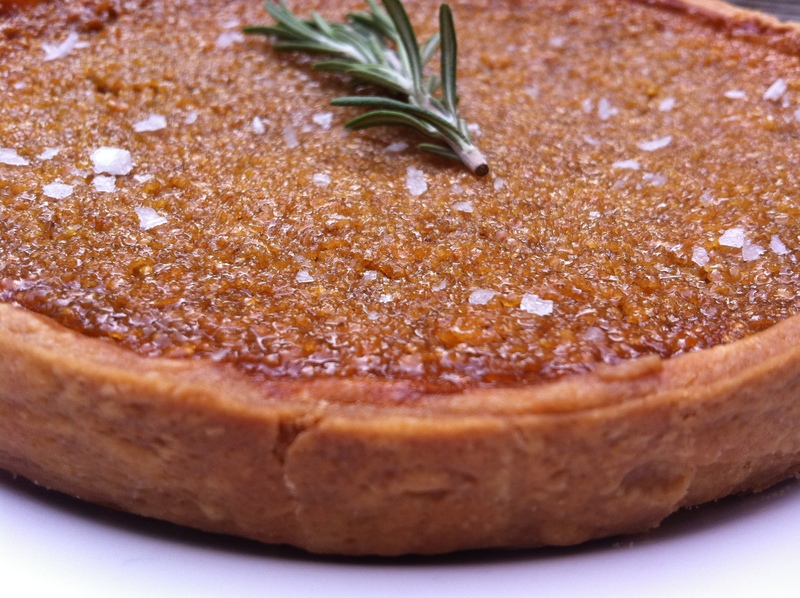 Elly – treacle tart is serious sweet overload (although I quite like that) so the rosemary salt really helps cut through it. Choclette – ooh I love the sound of rye sourdough breadcrumbs in this, great idea! Lora – it’s delicious – not dissimilar to a good, thick vanilla ice cream. This sounds really interesting. I love a little salty taste to sweet dishes! Rosemasy in desserts is something I never tried before.